Lane Electronics offers several ranges of D-subminiature connectors ideal for broad assortment of applications. Manufactured by Positronic, the series include both standard and high-density models as well as versions that are environmentally-sealed to IP67 and a solution for those that require to terminate fibre optic cables in a D-Sub format. The company’s standard density D-Subminiature series are high-reliability connectors offered in six package sizes with 9–50 size 20 contacts rated at 12A per contact. They are intended for board-to-board, cable-to-cable or board and panel-to-cable or board applications. 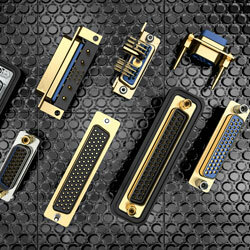 The high-density D Subminiature connectors are offered in six package sizes with 15–104 size 22 contacts rated at 9A per contact. Like the standard density versions, these are intended for board-to-board, cable-to-cable or board and panel-to-cable or board applications and are offered in RoHS and non-RoHS compliant versions. The high-density Combo Series comprise high quality, high-reliability D-Subs with the capacity to mix signal, coax, power, high voltage air and thermocouple contacts in a single connector. The company’s Combo D- Sub connectors highlight multiple package sizes and contact variants plus a broad range of accessories and options including blind mate and sequential mating.